China, officially the People's Republic of China, is a sovereign state located in East Asia. It is the world's most populous country, with a population of over 1.35 billion. The PRC is a single-party state governed by the Communist Party, with its seat of government in the capital city of Beijing. It exercises jurisdiction over 22 provinces, five autonomous regions, four direct-controlled municipalities (Beijing, Tianjin, Shanghai, andChongqing), and two mostly self-governing special administrative regions (Hong Kong and Macau). The PRC also claims Taiwan – which is controlled by theRepublic of China (ROC), a separate political entity – as its 23rd province, a claim which is controversial due to the complex political status of Taiwan. The ancient Chinese civilization – one of the world's earliest – flourished in the fertile basin of the Yellow River in the North China Plain. 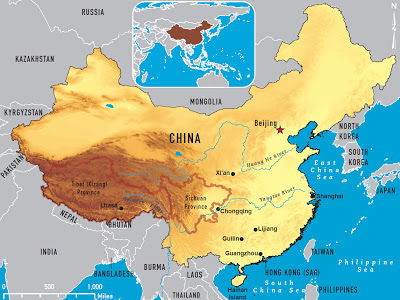 For millennia, China's political system was based on hereditary monarchies, known as dynasties, beginning with the semi-mythological Xia of the Yellow River basin (c. 2000 BCE). Since 221 BCE, when the Qin Dynasty first conquered several states to form a Chinese empire, the country has expanded, fractured and been reformed numerous times. The Republic of China (ROC) overthrew the last dynasty in 1911, and ruled the Chinese mainland until 1949. After the defeat of the Empire of Japan in World War II, the Communist Party defeated the nationalist Kuomintang in mainland China and established the People's Republic of China in Beijing on 1 October 1949, while the Kuomintang relocated the ROC government to its present capital of Taipei. Since the introduction of economic reforms in 1978, China has become one of the world's fastest-growing major economies. As of 2013, it is the world's second-largest economy by both nominal total GDP and purchasing power parity (PPP), and is also the world's largest exporter and importer of goods. China is a recognized nuclear weapons state and has the world's largest standing army, with the second-largest defense budget. The PRC has been a United Nationsmember since 1971, when it replaced the ROC as a permanent member of the U.N. Security Council. China is also a member of numerous formal and informal multilateral organizations, including the WTO, APEC, BRICS, the Shanghai Cooperation Organisation, the BCIM and the G-20. China is a regional power within Asia and has been characterized as a potential superpower by a number of commentators.